After I graduated from college, I became very seriously ill, and God sent me a wonderful doctor who helped me understand how my hormones had been affected. I became enthusiastically dedicated to researching foods that would help heal me and optimize my body, feelings and energy. You want your body to grow stronger and healthier every time you drink water or eat a meal or make yourself a smoothie after working out, right? That is why we eat, after all, because our brain tells us that our stomach needs nutrition to fuel our activities. However, did you know that in white flour and white sugar, there are hardly any nutrients to nourish and heal you? They contain simple carbohydrates and sugars, yes, which your body instantly pumps into your bloodstream as sugar (and gives you a “sugar high”), but that causes a problem, because then your body tends to release too much insulin into your blood and causes you to crash and feel lethargic, which makes you crave more sugar and initiates a vicious cycle. This causes you to actually be addicted to the harmful sugars, and leads to diabetes and serious health complications. My doctor recommended that I instead choose whole wheat or dark rye bread, skip the sugar, always include healthy protein like fish when I ate carbohydrates, and to go heavy, like at least half of my plate, on the colorful veggies and fruits. Really, think: the more alive your food is, the more alive you will be after you eat it (and I am not talking about sushi or cannibalism!!) Fresh, preferably local and organic, vegetables and brightly colored fruits super-charge your body with vitamins and micro-nutrients that all of your biological processes need in order to function. When you don’t get them, you become diseased. Specific vitamins cure specific problems. For example, vitamin C and vitamin E are powerful antioxidants that help reverse cancer. If you ramp up your vitamin C intake by seasoning your fish with lemon juice marinade and dishing out a healthy serving of spinach as a side, and pile a heaping portion of blueberries on your angel food cake, you can help your body stave off the malignant attack on your cells. If you feel a nasty cold threatening to overwhelm your defenses, try purchasing a package of zinc lozenges (they look like cough drops, but they have a high dosage of zinc, and by sucking on them, you will dry up the cold virus trying to multiply in your mucous membranes around your mouth, nose, ears and sinuses.) Cold-Eze makes these, which you can get for about $4 a box, or the generic brands can be had for about half of that. Zinc has been clinically proven to shorten the duration of the common cold. Honey is also great for your immune system, and drinking great quantities of hot tea (echinacea tea or green tea) with honey can effectively flush your system of the harmful diseased cells. Getting extra sleep is another key to healing your body, which can replenish and renew itself while it is asleep in a way that is less likely during the day, because your daytime energies are being directed at work and coping with stress. Nightly rest is an often overlooked and minimized element of good health. Dr. Louis Ignarro, Nobel prizewinner, emphasizes resting at night in his book, “The New Heart Care,” and refers to sleep as a foundational piece of the health puzzle. New brain and spine research have also discovered that your spine sends fluid to ‘wash’ your brain cells at night while you sleep, and that sleep deficiency can cause memory loss and dementia, etc. Did you know that the smell of peaches has been clinically proven to act as an antidepressant? Fresh peaches can chemically lighten your mood, and, even better, have no painful side effects!! What’s not to love?!! The list could go on and on: there is a compound found in tangerines that is actually used as an anti-inflammatory agent in pharmaceuticals for patients with knee problems; the omega-3 fatty acids in salmon, avocadoes, and olive oil can help cleanse the veins and arteries of people at risk for heart disease and stroke; and dark greens with their micronutrients can help prevent birth defects in pregnant women and alleviate Alzheimer’s and Parkinson’s. I will devote more space to these wonderful properties of vegetables and fruits in future posts; for now, I want to give you hope and motivation for choosing wonderfully colorful spinach, carrots, romaine lettuce, cherries, salmon and many more healthful foods to heal your body. 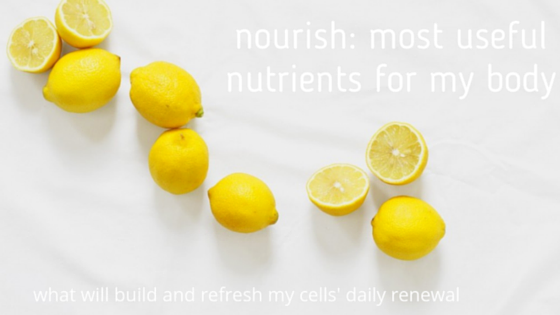 Not only do they nourish your cells, they nourish your soul and your being by their alive, real taste, and proper preparation of them gives you a gourmet meal to enjoy. If it doesn’t taste good, what’s the point?